The flowers of spring are gone and summer is upon us! Houston is turning into a lush overgrown jungle of green with all our torrential rains. Our plants here at Ravenscourt are hanging in there but some are not too happy. Last week in Toronto at the annual Garden Bloggers Fling they were just starting to plant annuals. It looked so bright and cheery with everything in flower. I think they are a season behind us : ) Below you see one of the gardeners dressed in period costume planting out the annuals in the mosaic garden at Parkwood Estate. 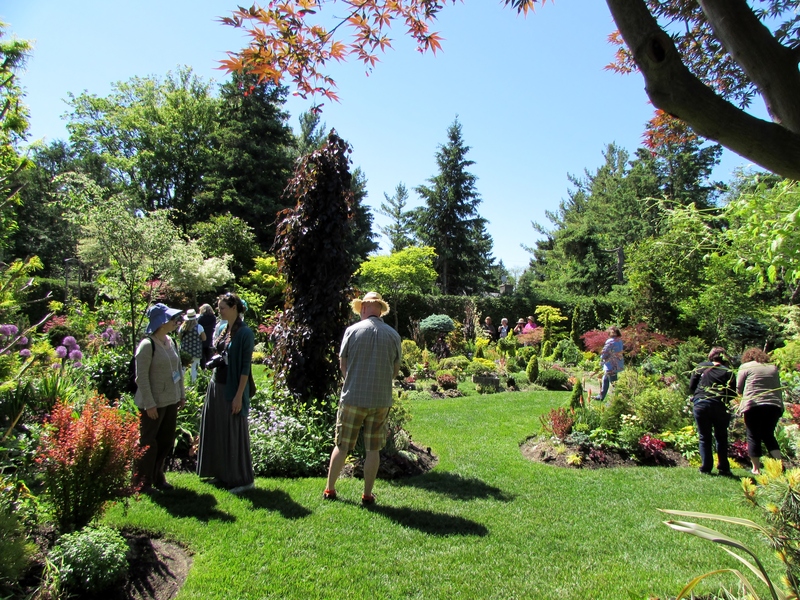 Here are my fellow flingers at the vibrant garden of Marion Jarvie a popular instructor at the Toronto Botanical Garden. And one more so you can see the variety of plants and colors! 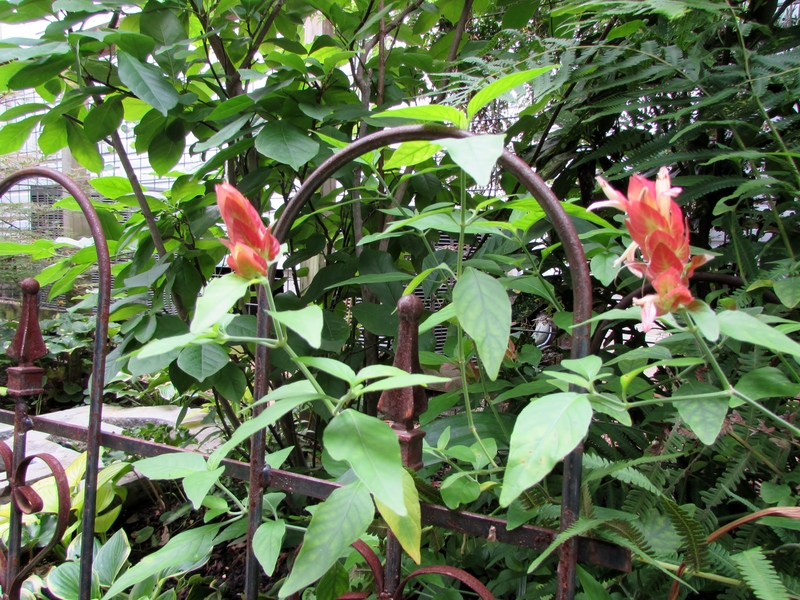 I did find a few blooms in our garden to share with you today. The sky is overcast and there is a tropical depression in the Gulf of Mexico that may be headed our way. I say no, please Nature send it to California! 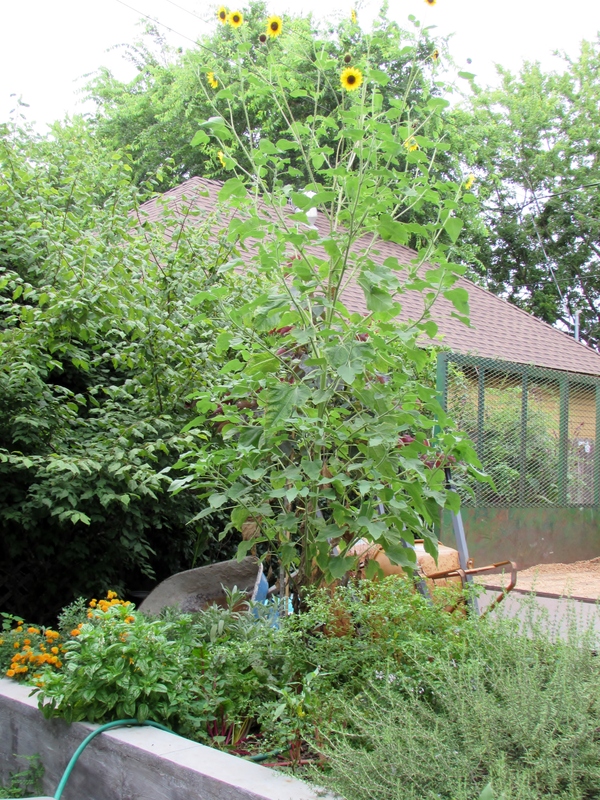 Here is a wild sunflower we let stay in our raised veggie bed. Volunteers. Sorry the pictures are not very clear today…the sky is dark and cloudy. And I am taking these between rain storms. 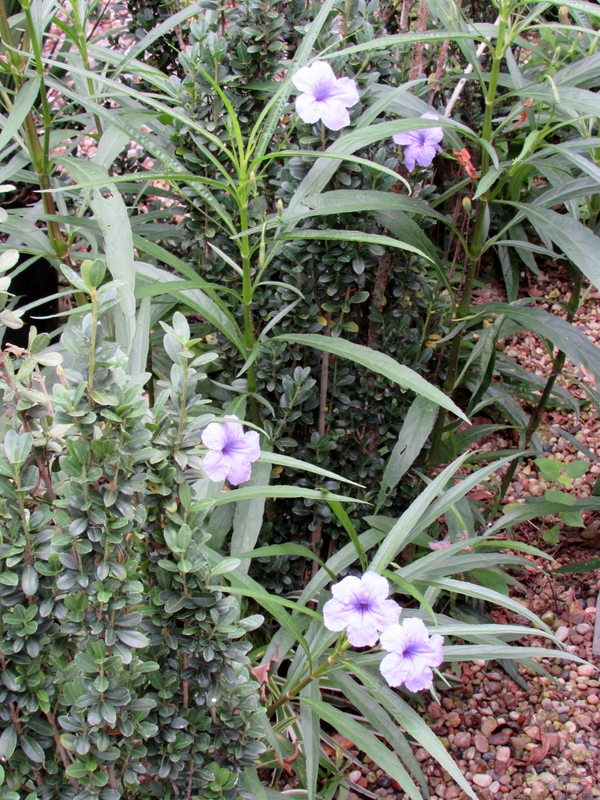 Mexican Wild Petunia, ruellia caroliniensis, a volunteer that has decided to mix in with our Sky Pencil hollies. 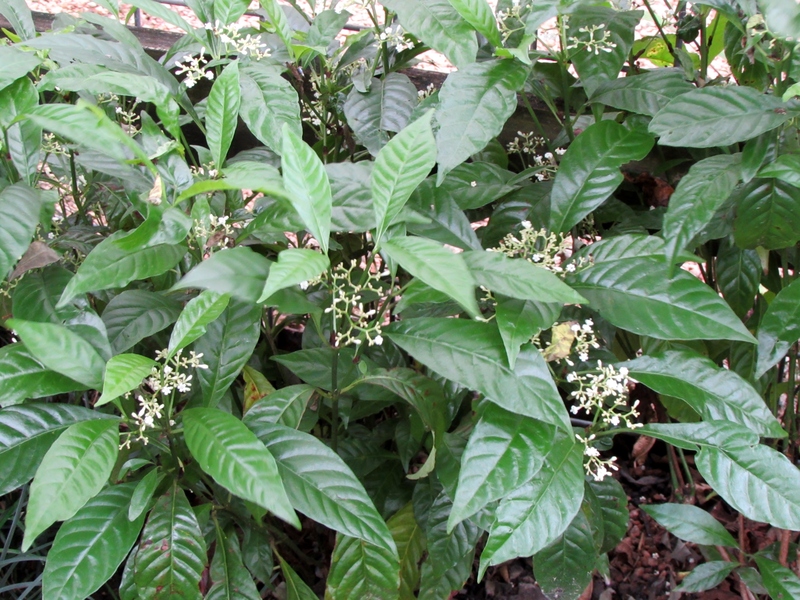 Psychotria nervosa ‘Little Psycho™’ a dwarf coffee plant. It has been here over a year and this is the first time it has flowered. It is growing in light shade and seems quite happy. 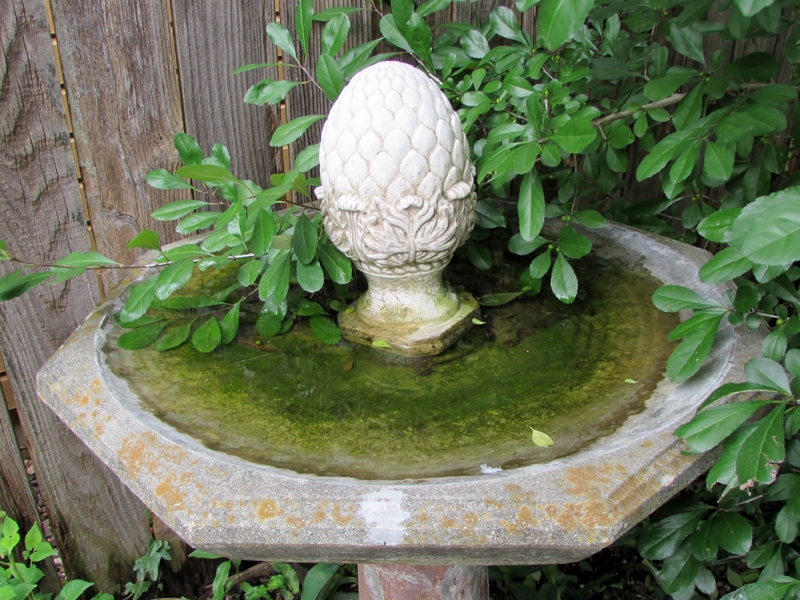 A fun shot of our back garden birdbath. It has been refreshed with rain water for 2 months now. 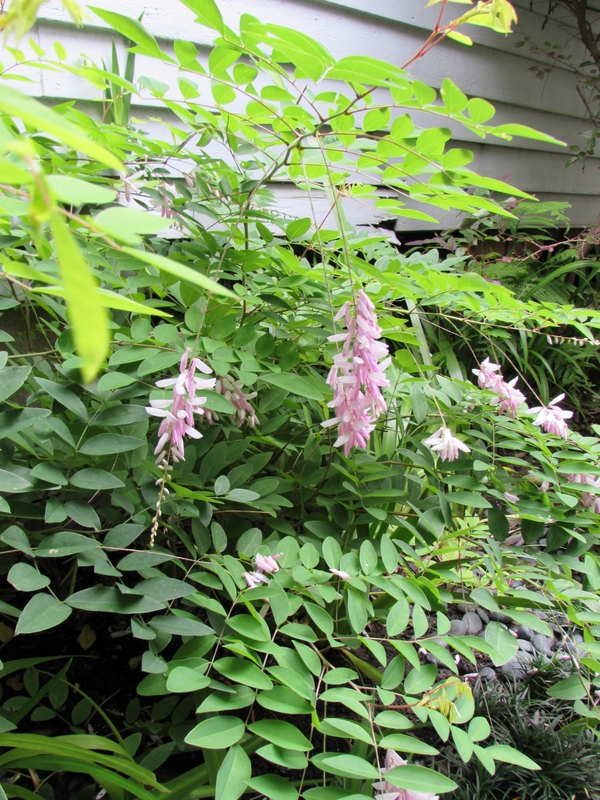 Indigofera kirilowii (Chinese Indigo) loves the south-side of our house that had nice mid-day sun. It has been blooming for a couple of months now. 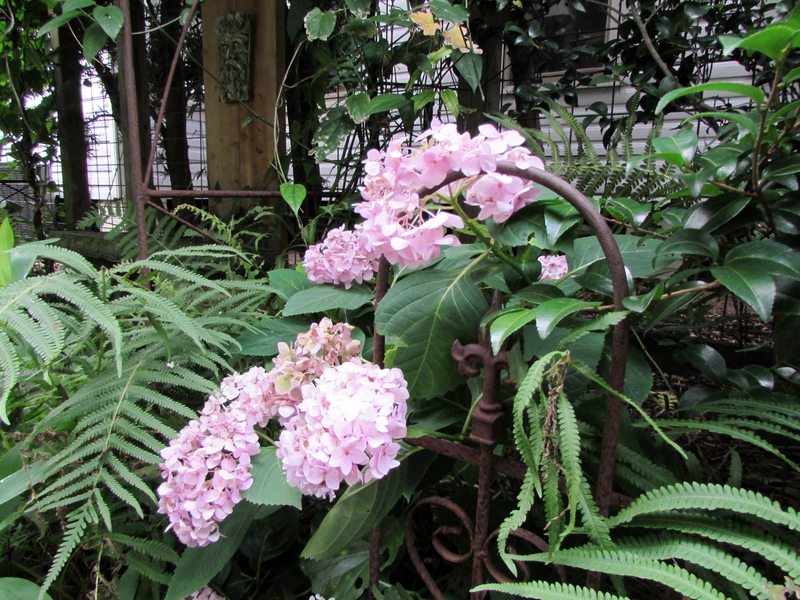 Hydrangeas that lived in a pot on the porch for years and finally got planted. They are super happy! And another bit of old fencing. 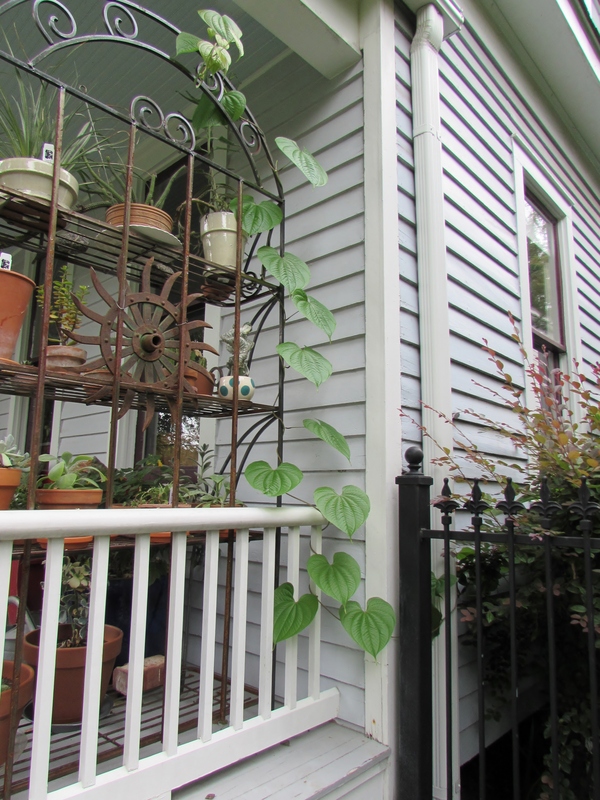 In the background you can see the arbor and the Green man plaque on the fence. Belize Sage, Smooth-leaf Sage, Salvia miniata. I find this one very hard to photograph. It is right out my office window and attracts lots of pollinators. 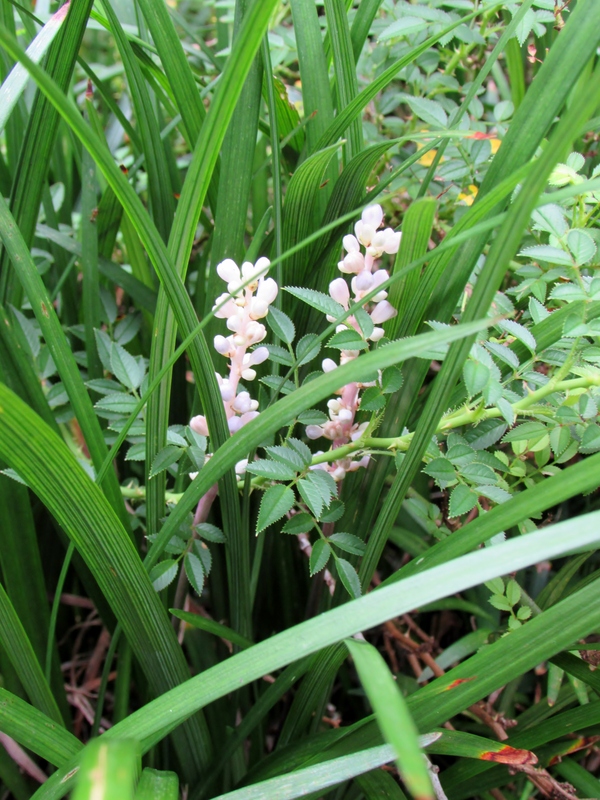 Looking down I spy little pale flowers on the liriope. Some years they are deep purple. I don’t know why they are so pale this year. 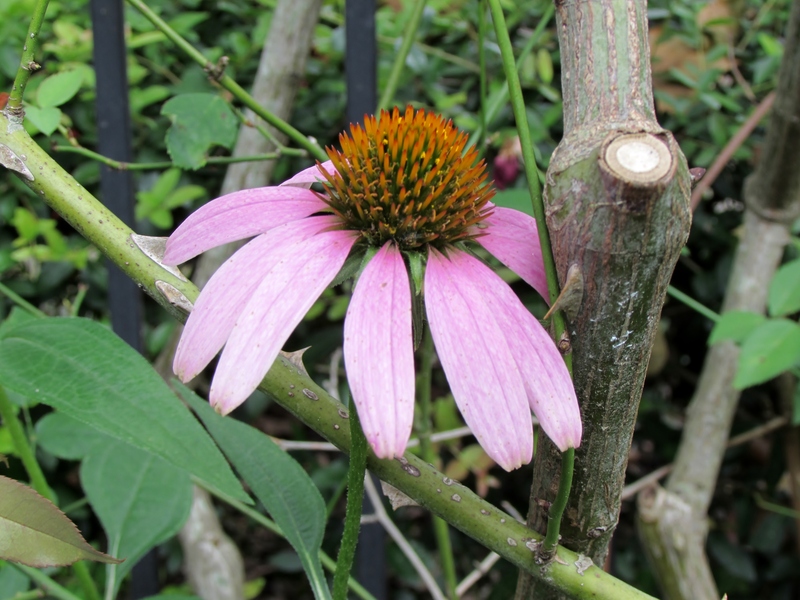 Below is the first coneflower I have planted that didn’t die; and it actually bloomed! 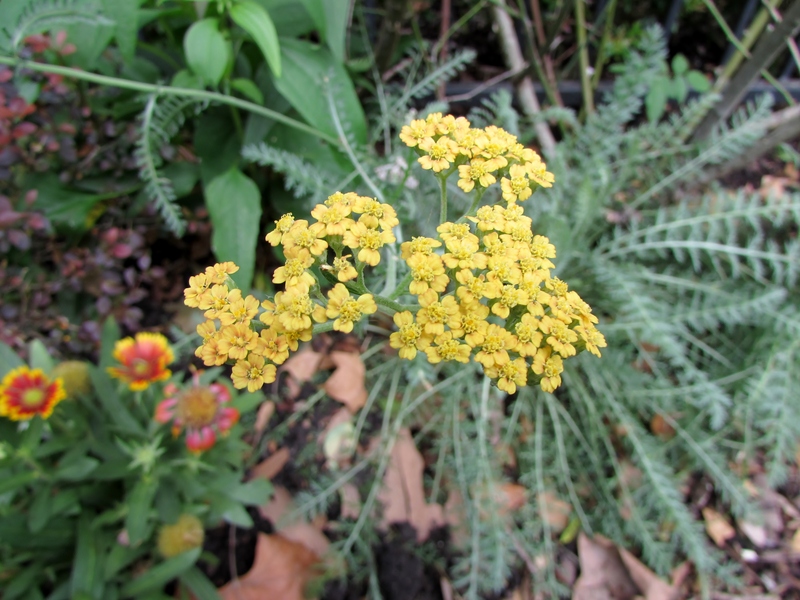 Terra Cotta Common Yarrow, Achillea millefolium ‘Terra Cotta’ in the background are Blanket flowers. The tiny flowers on the Jewels of Opar are very hard to photograph. This is a really fun plant. It died back to ground last winter but came back in full forces as soon at the weather turned warm. are equally hard to photograph. 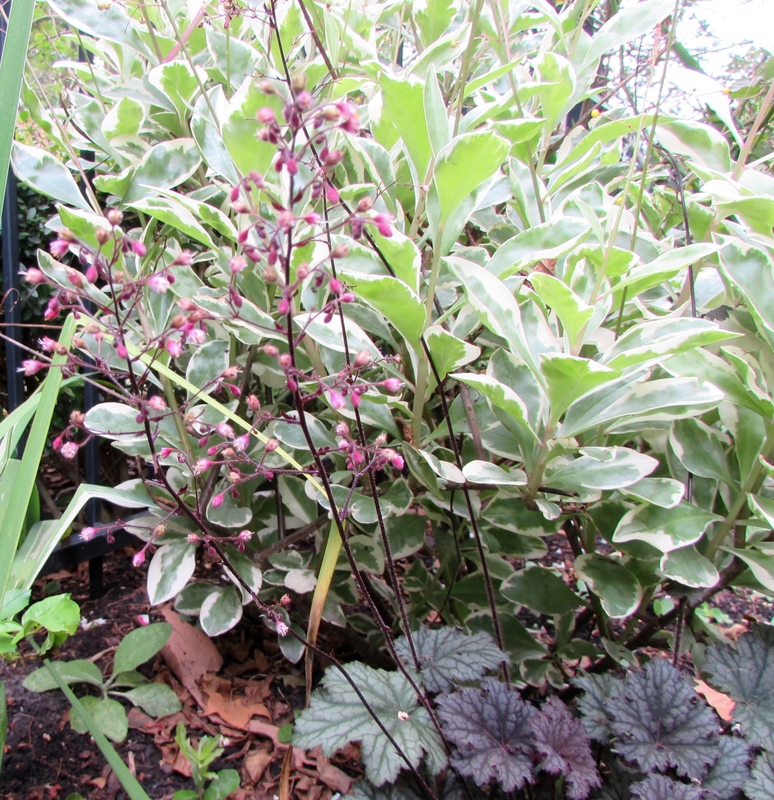 I did not plant either of these plants for the flowers but it is funny how similar they look. Another little volunteer that I am leaving. I love the delicate blue flowers. 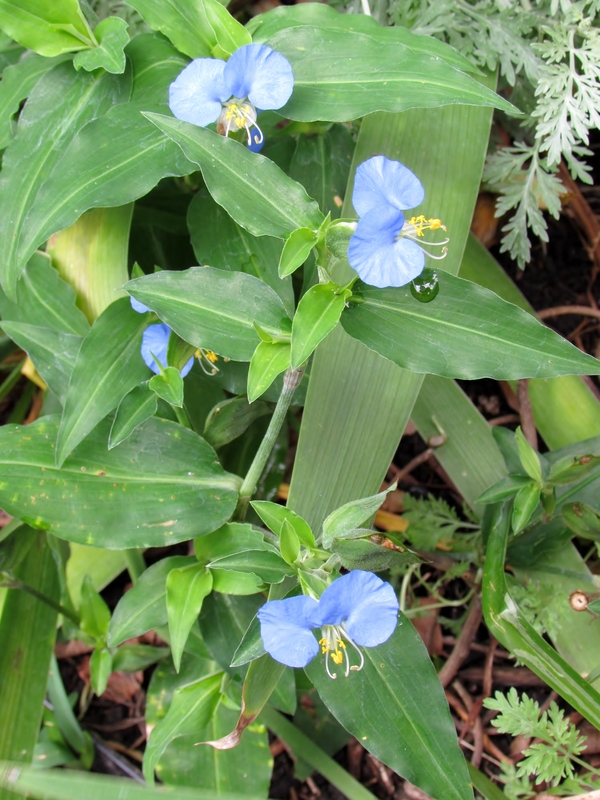 Commelina cyanea, commonly known as scurvy weed, is a perennial prostrate herb of the family Commelinaceae. 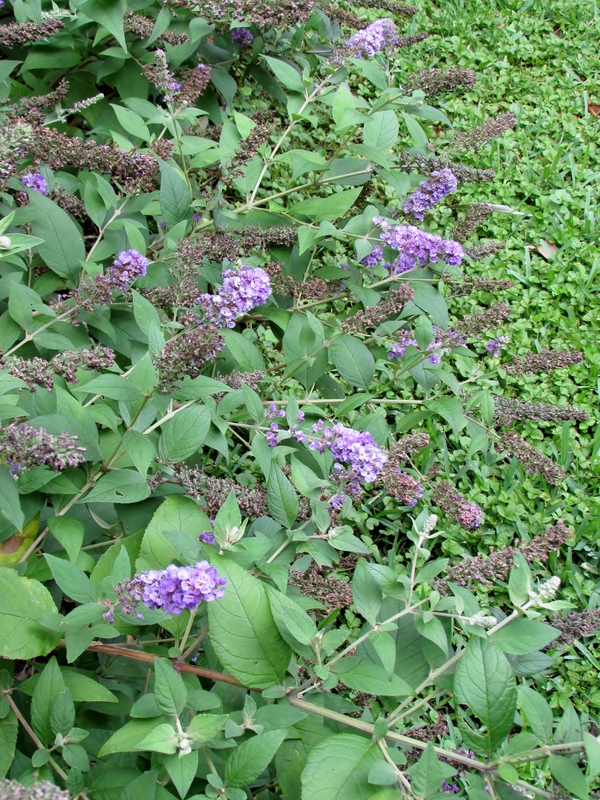 Blue Chip’ buddleia – Butterfly Bush is still blooming and will continue through most of the summer. Iris Neomarica caerulea ‘Regina’, or commonly called the Giant Apostles’ Iris are still blooming to our amazement. The variegated leaves are from a plumeria. There are a few other plumeria tucked into this row of Giant walking iris. 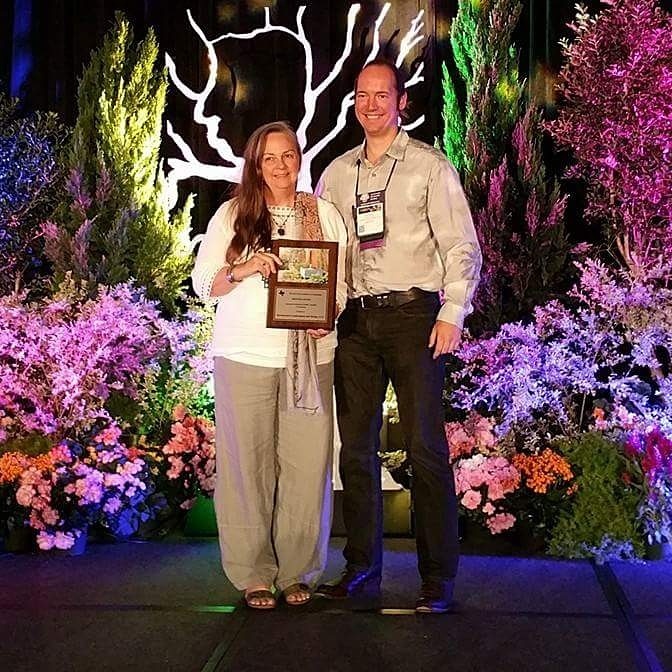 Here is a link to a great post on another walking iris. 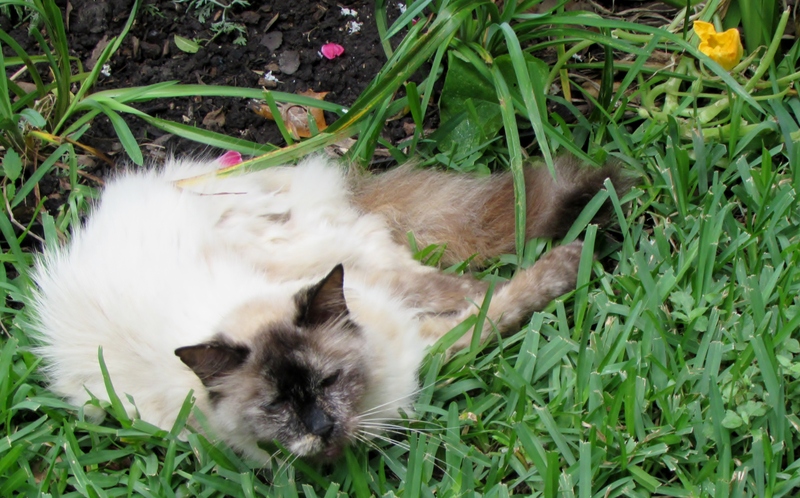 Here is our cat Viola with a volunteer squash blossom. 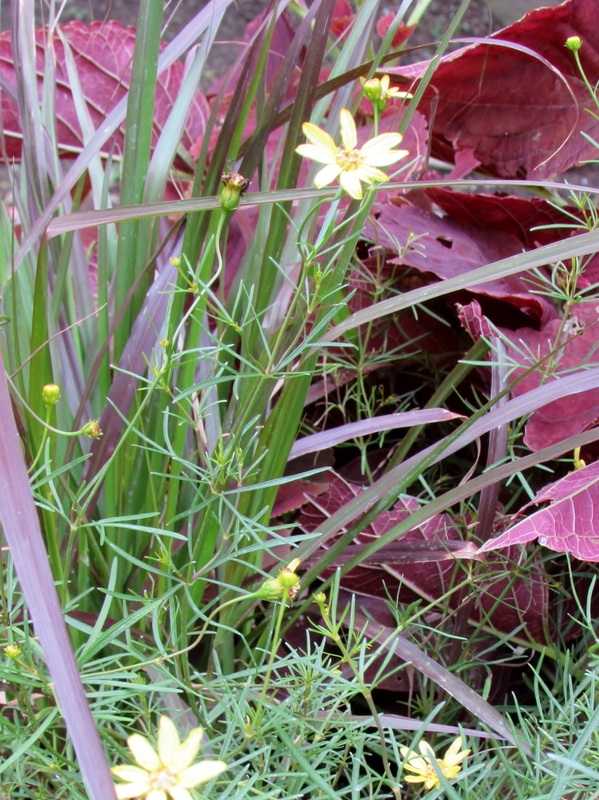 Moonbeam Coreopsis, Coreopsis verticillata ‘Moonbeam’ one of the plants in our urns. 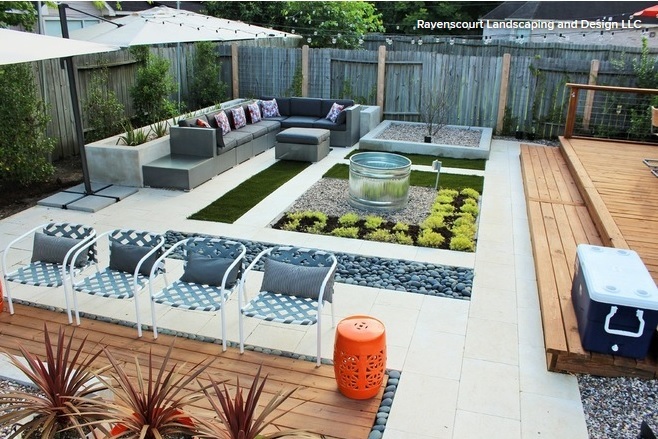 That’s it if for June at Ravenscourt Gardens. 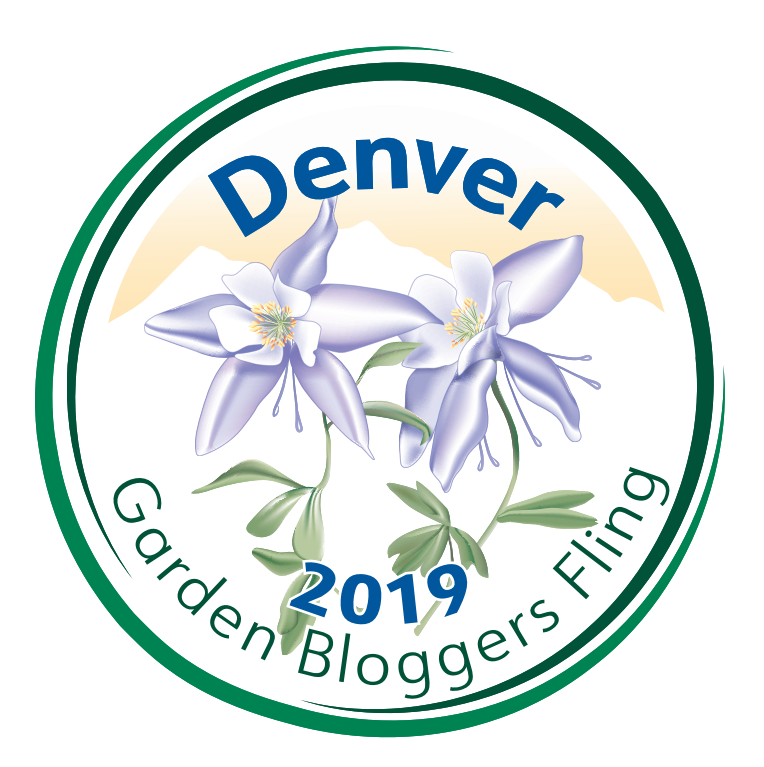 For more bloom day pictures click here to go to our host May Dreams Gardens and see all the bloggers posting their June flowers. You do have some interesting blooms. I have never seen many of them before. I love the gorgeous Neomarica and a pink Liriope, I have never heard of such a thing. Jewels of Opar is a new one for me too, so pretty. What a tour Laurin, thanks, what variety. Iris Neomarica caerulea ‘Regina’, is a very similar cultivar to the one I posted about yesterday. I noticed that and went back and put a link to your post. I hope that is okay! It is was our pleasure, hope to stay connected! Nice blooms all around. I couldn’t resist your “Hot and Humid…” title–I think that pretty well describes most of Texas right now. The Iris Neomarica are quite something–I’ve never seen them before. 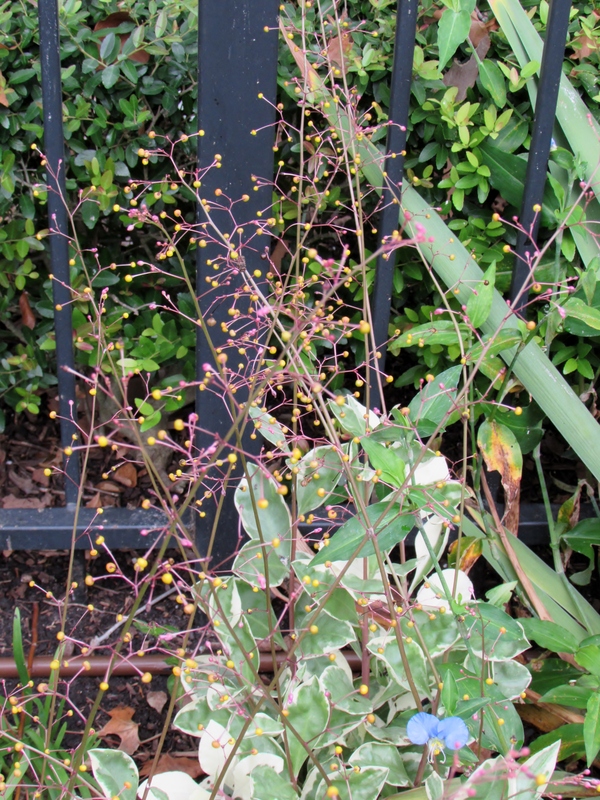 As well, I like the variegated Jewels of Opar–very pretty. It is the weather for half of Texas…I don’t think it is humid in El Paso : ) Walking irises are totally awesome and zero maintenance. I am really please with the Jewels of Opar, and i did actually just buy them for their name. 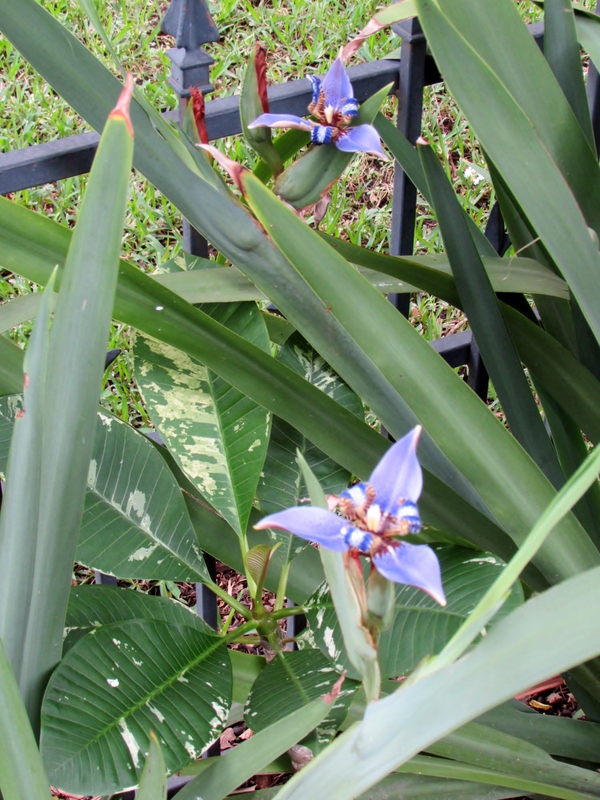 I thought I identified a plant I have growing in my garden from your photos, but not likely when I saw it was tropical. It looks just like your sage, but that would never grow here. 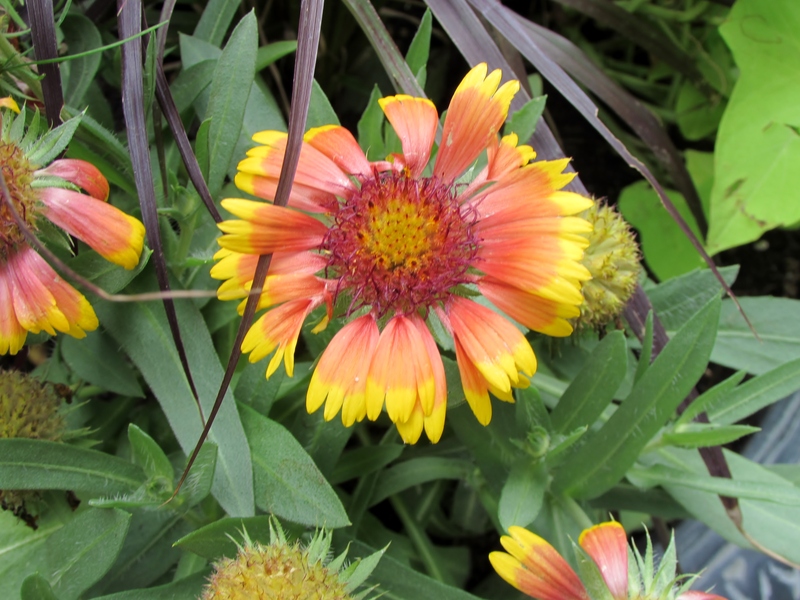 The plant is perennial not annual, so I am stumped with it. It is going to a horticulturalist tomorrow. 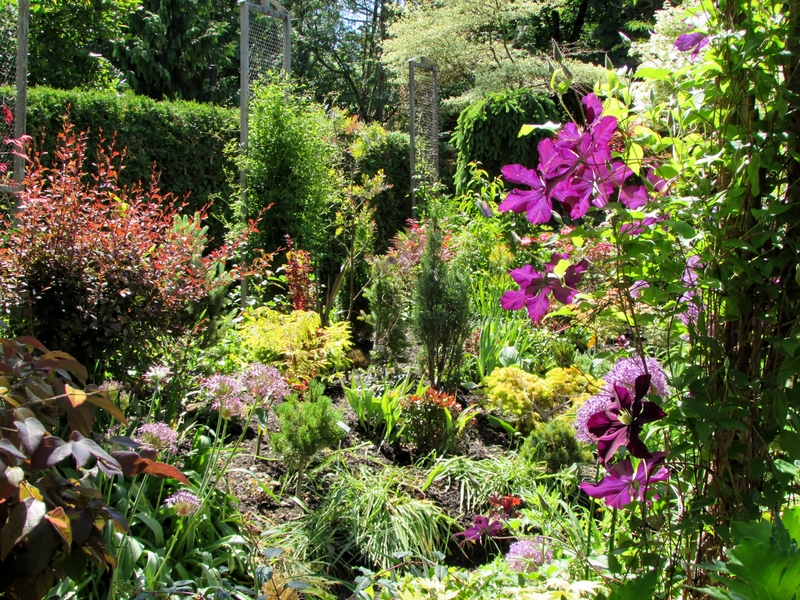 The Jarvie garden was vibrant. Your sunflower is a giant! Just thought you might not know that my little cardinal is for Nature and Wildlife Pics. For some reason, when I post a comment it shows up for GWGT. Are you talking about the Salvia Mininata? 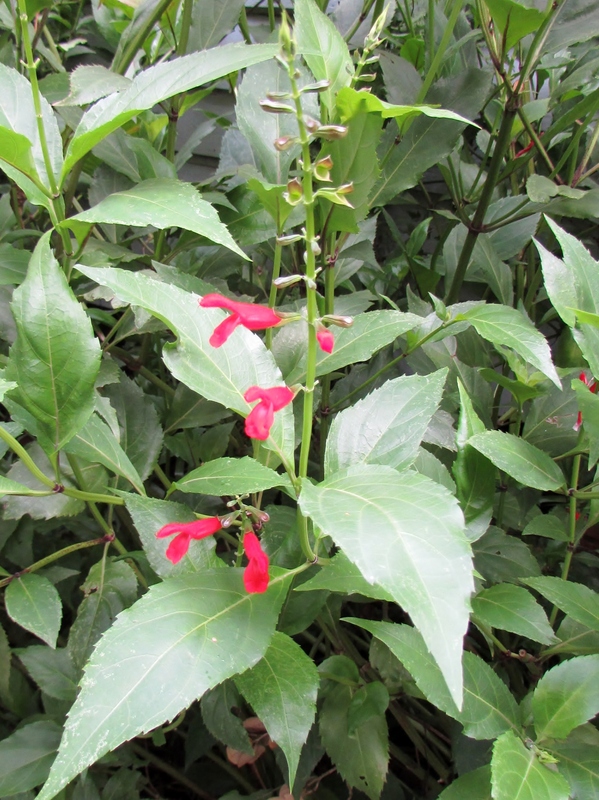 Looked it up again and found “Salvia miniata is a wonderful Salvia for shady spots, and produces 8″ spikes with cardinal red flowers adorn this 3×3′ plant with it’s glossy green leaves and it blooms from early summer until frost. I love the cardinal…we have some that come back every year to feast on the seed of our Purple Montrose Vitex tree. That’s the plant. It grows back each year and I don’t know where I got it from, hence no plant tag. Thanks for the info. I spy Cistus labels on your bakers rack! Love the Jewels of Opar, and Viola is a darling. Sooo lush. Sooo beautiful. You really have created something beautiful!